Note that the constant c is unknown! The original function f(x) could have been 3x2 + 5, 3x2 + 10, 3x2 + anything, and the derivative of f(x) would have still been 6x. 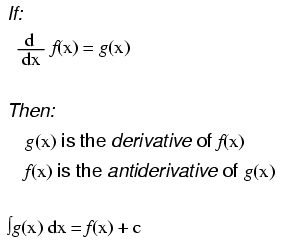 Determining the antiderivative of a function, then, is a bit less certain than determining the derivative of a function.